After the relative failure of All New World of Lemmings compared to the sales of the other games in the series, DMA Design moved away from the franchise. 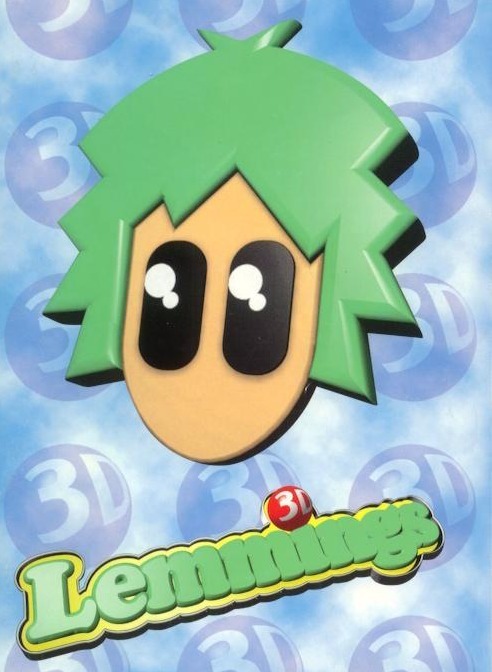 In their place was developer Clockwork Games, who would make an attempt at putting the lemmings in the third dimension. Pretty much every new feature from the second and third games are gone, and everything is back to the way it was in the first game. No more items, tribes, cannons, enemies, or hadokens. Just a bunch of lemmings trying to get from Point A to Point B. It would make sense that they’d take after the original game so strictly, since that’s where the most sales were. The game’s divided into eighty levels, twenty each for the four difficulties: Fun, Tricky, Taxing and Mayhem. You’re given a certain number of lemmings per level, and either you hit your quota or you’re doing it over. The major difference this time around, as you’d expect, is that the game is entirely in 3D. You control the camera from a first person viewpoint, flying around the level, while at the same time commanding the cursor to assign abilities. 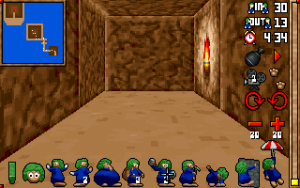 While the left mouse button still selects abilities and assigns them to lemmings, the right mouse button is used for camera control. By holding down the right mouse button and moving it around, you can move the camera forward, backward, and side to side, as well as rotate it in a circle. You can also control the camera with the keyboard. A bar on the right shows your current altitude in the level, and you can drag the bar up or down to move the camera higher or lower. 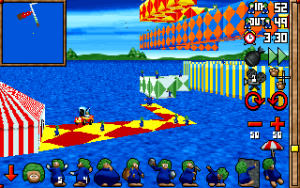 Each level also has multiple cameras, represented as floating video cameras in the sky, and you can change the current camera angle at any time with the click of a button. The camera system works decently. When you rotate the camera, it tends to spin in wide circles, making it a little difficult to focus on what you’re trying to look at. Thankfully, you can pause the game at any point and set the camera in a comfortable position, although with how many things can get in your way and block your vision, it can take a while. 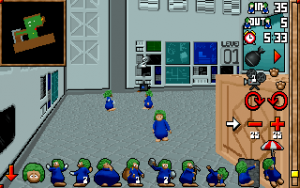 There’s also a feature called “Virtual Lemming” that’s used in quite a few levels. 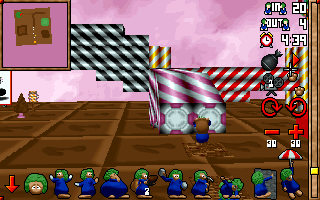 When it’s used, it gives a first person viewpoint of the lemming it’s used on, and while you’re using this, you’re still free to use skills. Since the game camera just can’t go through walls or obstacles, you’ll need this for when your lemmings get into a closed space. The ability set is taken from the original Lemmings, so you’ll need to get reacquainted with the old skills like Digger and Basher. There is one new skill, called Turner, which causes the lemming it’s used on to stop and turn lemmings in a certain direction. 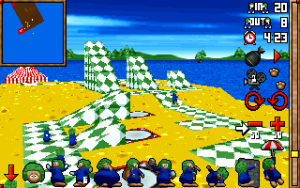 Since there’s now paths for the lemmings to take besides just left for right, you’ll need this in order for your lemmings to actually use them. 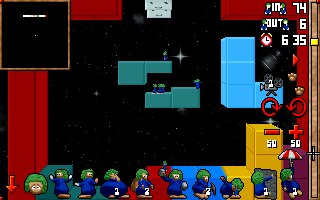 The levels are a bit more complicated with the addition of the third dimension, with a lot of paths for your lemmings to follow and structures that need to be maneuvered around or explored. 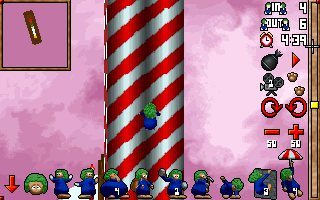 Some of the level hazards from Lemmings 2, like slippery ice and trampolines that bounce your lemmings into the air return, along with new gimmicks like rope slides and block that split your lemmings into two rows. Sadly, the traps, one of the most interesting features for people who, shall we say, aren’t very invested in the success of the lemmings, are kind of lame. Like the bear trap which makes lemmings・shrink away into nothing. The game feels slightly easier than the 2D entries in the series, oddly enough. The timing on some of the powers is a bit kinder, so now you won’t waste a Basher power if you don’t use it right next to the wall. The levels are also a bit easier to make your way through, at least early on. Sadly, there’s still quite a few times when having just the wrong timing can screw your whole attempt. Thankfully, however, every time you reset a level, the game will replay what you did up to the point you decide to jump in, so screwing up is slightly less of a concern. 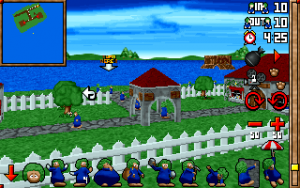 There’s also a nice “Highlight Lemming” feature, where using it on a certain lemming will put a big arrow over them. Clicking on a power while the lemming is highlighted will make him use it without having to click on him, which is SO useful when the lemmings bunch up into a crowd. The graphics are a mixed bag, although it was probably a smart idea that the developers didn’t go with models. The lemmings and some of the background elements are made from sprites, with the levels geometry itself being 3D, sort of like Doom. The 2D sprites look fairly decent until you zoom in close, which makes them look incredibly pixilated. 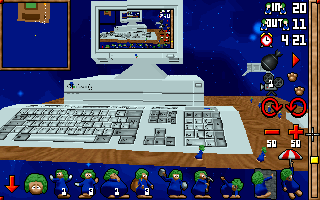 Some of the sprites also get in the way of actually seeing your lemmings, forcing you to stop everything and swivel the camera around to tell what’s going on. The levels, however, are pretty blocky, consisting entirely of blocks with 90 and 45 degree angles, although there’s some nice texturing going on. There’s a decent amount of level themes, including a level where the lemmings have to contend with a giant desktop computer, the screen of which is showing the exact thing your monitor is showing you then. The candyland theme, oddly enough, has advertisements for Jelly Belly jellybeans all over it. One has to wonder if this game ended up selling more candy than Zool did. The music is decent, and this time you get the choice of having the music play through your sound card or through CD audio. The CD audio is definitely the way to go here. A small nitpick is that there’s now a lemming voice that shouts out the name of an ability every time you select it, and with how often you switch them, that can get annoying fast. 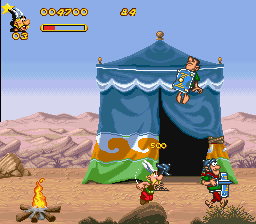 The console versions of the game are more or less identical to the PC port, except for the issue of having to use a controller compared to a mouse and keyboard. 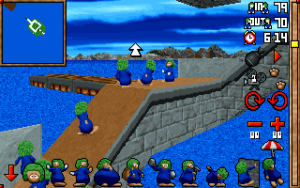 Overall, 3D Lemmings works a lot better than you’d think the concept would. It’s not perfect, since there’s the kind of camera issues you’d expect from an early 3D game, but it’s surprisingly playable. 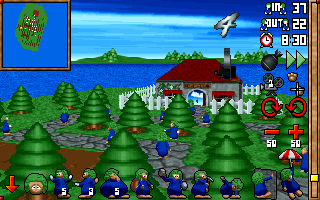 The fact that the Lemmings 2/AWoL elements are gone does make things easier to pick up on, and it’s generally a pretty fun game, despite the fact that not all of it has aged perfectly. 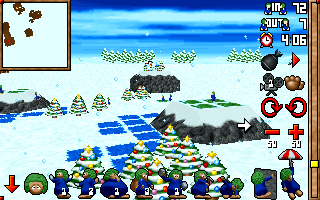 Since 3D Lemmings was based more on the original games, it’d make sense that Clockwork Games would try their own hand at making a Christmas level pack. This is a demo featuring six new stages with a wintry theme. Sadly, they didn’t bother with any new music, so there’s not much to this unless you’re looking for more levels for 3D Lemmings.